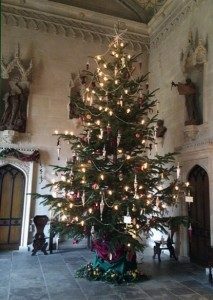 The Abbey’s Great Hall and cloisters are beautifully dressed for the season, with decorations inspired by a Fox Talbot family Christmas in 1845. Why not try one of the lovely comfortable Windsor chairs, modern copies in the style of Chippendale, and toast your toes by the log fire. No mulled wine or mince pies here but return to the village where you can enjoy some seasonal hospitality at The Red Lion Inn. 1 Church of The Holy Cross, Seend. When William Tipper died in 1651, he bequeathed £50 to the Church of the Holy Cross in Seend. The money was to be distributed at the chapel wardens’ discretion to the ‘poor people of Seend’. 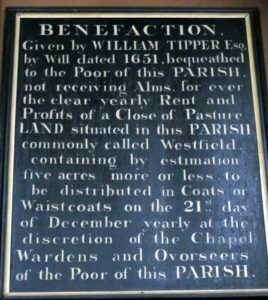 The money was later invested in part of the West Field, known as ‘Tipper’s Ground’ or ‘Poor Ground’ and the rent was used for warm coats for the old men of the village. They were ‘great coats’ or ‘waistcoats’ but became known as ‘Bugge Coats’ from the thick white ‘bugge cloth’ they were made from. They were handed out at Christmas. The style of the coats remained the same until 1906 when they were given a more modern cut and colour. Source WSHC. It’s wonderful to know that people still visit libraries and that there are a large number still open. Fortunately in Wiltshire, no libraries have shut although hours have been reduced in most and volunteers have replaced some paid staff. I went to visit the library in Lyneham & Bradenstoke (Pop 5400) which is housed in the 1920 Memorial Hall. It is run by a rota of 28 volunteers who manage to keep it open six days a week – either for a morning or an afternoon and early evening. It’s a delightful place full of light and colourful displays and even manages to run activities for small children in what is quite a tiny space after you’ve put in shelves, tables, seating, a computer, and self-service machines. 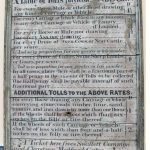 Best of all, for me though, were the fascinating reminders of the village’s past – the WW1 memorial tablet on one wall and opposite, salvaged from someone’s garage, a lovely mid 18th century Turnpike Toll Board showing charges for Lyneham Green Gate such as ‘For every Horse, Mule or other Beast drawing any kind of carriage or vehicle 4½d’. At least there’s still free passage to a getting a good book to read in 2014.